More catalogs needs more web space. If you donate, better and bigger catalogs will be soon available. You can safely try the catalogs. If you delete the TDF file, Guide will not know the catalogs anymore. If you experimenting with the TDF files, please make a backup. Guide cannot use too much characters and will crash with wrong TDFs. But don't worry! Deleting the TDF, and Guide is running as before, also after it has crahed several times. For using the catalog, it's not useless to know, how TDF file are used by Guide. You copy the TDF file to the directory, from which Guide is running. The enclosed TDF assumes, that the uncompressed data are in the sub-directory with the sub-catalog's name in the the Guide directory. If you save the data in another directory, you must give the full name with assigned letter of the drive. It's useful to take a look at Guides 'star display' sub menu (screen copy at right). Try to play with the values, to get a nice presenattion of star images for your use. There are some problems, which are the consequence of the massive data. To avoid Guide working very slowly, the data are stripped in 1-deg zones and are only shown, if the screen width is lower than 5 degrees or so. You can change this behaviour with the "field" entry in the TDF file (see TDF explanations or play with the numbers). 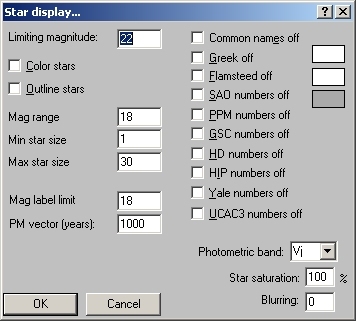 A full sky sorted catalog would make Guide extremely slow, because it must go through the billion star catalog each time. The 1-deg zones are unfortunately single entries in Guides menu entry "Extra/Toggle user datasets". So you can disable only single zones and not the complete catalog. At preset all zones are enabled. If you want to avoid changing the zones visibility, you can write protect the TDF file. To disable the complete catalog, rename the TDF file e.g. to TD and Guide don't know it anymore. At the hemisphere poles, Guide often let out a little pie of data. This is an error of Guide. Michael Koch found a solution for this problem: You can change the parameter "sort 1" into "sort 0" in the TDF files. Because Guide works this way very slow, this is made only at +89, +88, -88 and -89 deg zones. If you find another really missing section of stars, please contact me at gaia@jostjahn.de. Important: Don't try to download the TDF file with Internet Explorer or the Edge explorer of Windows 10. User reports show, that the carriage return of lines doesn't work and so Guide can't use the TDF files and crashs. With Chrome (and maybe other) browser it work's. Sometimes Guide is crashing, if you click after the right mouse click "next" for next stars information agai and again and then cancel the menu. The reason is unknown. Guide seems also have problems due to the huge amount of data (not in line, when Guide has updated last time, years ago). The problem appears in the way, that sometimes some rectangulars of Gaia stars are not shown (looks empty, because only the other stars are shown). This appears at the edge of the screen. If you click into the empty area, the stars appears in the new moved window. If you animate the stars to show the proper motion, the same effect happens after some thousand years and there maybe blocks of vanished stars. I don't see a method to change it. If any user find a problem in the data sets or have a solution for this problem, I would eager to hear it. If you want to save space at your drive, you can erase alls degree zones, you don't want to see. E.g. if you live at Iceland, maybe you don't want zones below -10 degrees. But you should erase then also the appropriate entries in the TDF file, because Guide may have problems, if it don't find the files. Use "STD" for the sub catalog directories name. The uncompressed catalog needs 76 GB space at your hard disk. It contains 1.692.901.510 stars. This catalog contains right ascension and declination in decimal system with 0.04 arc second accuracy. The G, B and R magnitudes are given to 1/100th magnitude. The proper motion is given to 1 milli arc seconds accuracy. No parallax or radial velocity are given. The coordinates are the center of the parallax ellipse. The epoch of proper motion is 2015.5, but for coordinates is 2000.0. The equinox of coordinates is J2000.0. To avoid problems with 4 GB size on FAT32 formatted partitions, the ZIP compresed archive uses all 18 ten-degrees-zone. All 18 ZIP compressed files has 19.4 GB. All 180 uncompressed files needs 76.2 GB space on your drive (please note, that ZIP and uncompressed files together needs more space: 96 GB). +80 to +90 degree (37 MB), uncompress into a directory "STD", located in the Guide directory. +70 to +80 degree (155 MB), uncompress into a directory "STD", located in the Guide directory. +60 to +70 degree (447 MB), uncompress into a directory "STD", located in the Guide directory. +50 to +60 degree (734 MB), uncompress into a directory "STD", located in the Guide directory. +40 to +50 degree (785 MB), uncompress into a directory "STD", located in the Guide directory. +30 to +40 degree (933 MB), uncompress into a directory "STD", located in the Guide directory. +20 to +30 degree (1.1 GB), uncompress into a directory "STD", located in the Guide directory. +10 to +20 degree (1.2 GB), uncompress into a directory "STD", located in the Guide directory. +00 to +10 degree (1.1 GB), uncompress into a directory "STD", located in the Guide directory. -00 to -10 degree (1.3 GB), uncompress into a directory "STD", located in the Guide directory. -10 to -20 degree (1.8 GB), uncompress into a directory "STD", located in the Guide directory. -20 to -30 degree (2.5 GB), uncompress into a directory "STD", located in the Guide directory. -30 to -40 degree (2.4 GB), uncompress into a directory "STD", located in the Guide directory. -40 to -50 degree (1.9 GB), uncompress into a directory "STD", located in the Guide directory. -50 to -60 degree (2.4 GB), uncompress into a directory "STD", located in the Guide directory. -60 to -70 degree (2.0 GB), uncompress into a directory "STD", located in the Guide directory. -70 to -80 degree (528 MB), uncompress into a directory "STD", located in the Guide directory. -80 to -90 degree (75 MB), uncompress into a directory "STD", located in the Guide directory. TDF file, save into Guide directory. Text file with explanations of columns. Just for information, Guide doesn't need this. Use "SPL" for the sub catalog directories name. The uncompressed catalog needs 16.4 GB space at your hard disk. It contains 1.026.562.268 stars. This catalog contains right ascension and declination in hexagesimal system with 1 arc second accuracy. The G-Magnitude is given to full magnitude precision. Stars with G>20 Mag are excluded. No parallax, proper motion or radial velocity or other magnitude bands are given. The equinox of data is J2000.0, but the epoch is 2015.5 (epoch includes proper motion). All Sky (3.4 GB), compressed as ZIP, uncompress all 180 files into a directory "SPL", located in the Guide directory. Make a new folder "guide_gaia_only"
Open the file "gaia-std.tdf" with an editor and search/replace "file ! :\STD\" to "file D:\Guide\STD\" using the actual path to the Gaia catalog. You don't want to have this catalog on your harddisk twice. There are 180 instances in the file that must be changed. Start Guide in the new folder.